Serge is hull number 2 in the Berings’s 65-foot expedition range and is ideally suited for long-range cruising in open waters. 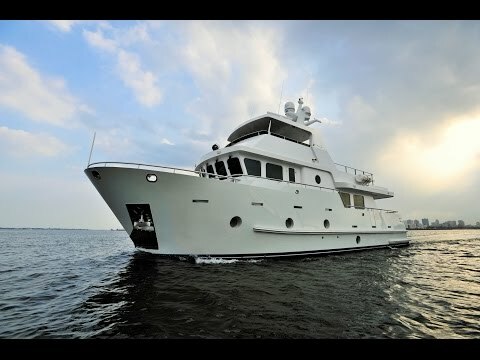 Designed with an all-steel displacement hull, the Bering 65 has an estimated range of 5,000 nautical miles at a cruising speed of 6 to 7 knots and features a raised pilothouse and, in Serge‘s case, twin Cummins QSL engines. The interior floor plan of the 65 includes three spacious staterooms, each with its own private ensuite head, and a crew quarters for two. The interior varnish of American Ash reflects the owners’ wishes, as does the custom-installed teak flooring, an extensive Furuno electronic package and Seakeeper M35 Gyro Stabilizer.